After its first week of games, the Webster University men’s soccer team starts out the season with a 1-2 record. All three games were characterized by strong defensive play and relatively quiet offensive play. Each game was decided by only one goal, as Webster’s defense surrendered three goals in three games. Coach Marty Todt said he is impressed with the squad’s patience and work ethic after the first few games. “The two most important ingredients at this point have been their work rate and their ability to have a little patience while the chemistry starts to come together,” Todt said. The Gorloks’ first game of the season was the home opener at Anheuser-Busch Soccer Park against Washington University. 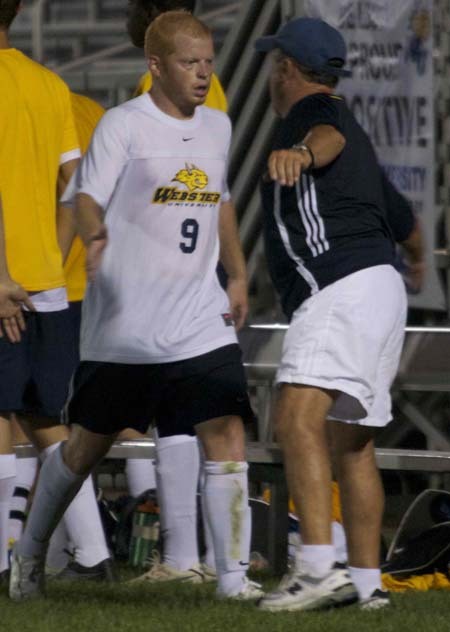 After falling behind 2-0, Webster scored its first goal of the season, courtesy of senior midfielder Bryan Enger. One goal was all the Gorloks’ offense provided in the game, however. The game was kept close with a solid performance by freshman goalkeeper Brian Woodward. After taking over for senior Alex Cupp at halftime, Woodward shut out the Bears’ offense during the second half in his first career game for Webster. He credits the defense with helping to maintain the second-half shutout. The team then traveled to the Chicago area for two games over Labor Day weekend. The first match against Concordia University Chicago on Sept. 3 was delayed due to rain, but the Gorloks eventually took the field. The result was similar to the WashU game, though, as Webster was defeated 1-0. The goal was scored by the Cougars on a head ball in the final minute of the first half. Despite their efforts, it was the same story for Webster’s offense, as they were stymied and shut out by the opposition. The team, at that point of the season, had only scored one goal in two games. The practices and perseverance finally paid off, as Webster won its first game of the season on Labor Day. The Gorloks defeated Aurora University 1-0 with McCaffery scoring the contest’s only goal. Junior midfielder Kyle Leonard was credited with the assist. Junior forward Clint Carder was shown a red card with about 20 minutes to go in the game, but the Gorloks held on, thanks in part to the shutout effort of Cupp and the goal by McCaffery. Todt said the team’s practice prior to the game against Aurora impacted the squad positively. Vogt said the first win is important to the team and is a step in the right direction. Webster continues a stretch of six road games when they travel to Bloomington, Ill., to play Millikin University on Sept. 10 and Illinois Wesleyan University on Sept. 11.